Bone marrow is found in the medullary cavities – the centres of bones. The bone marrow is where circulating blood cells are produced – a process known as haematopoiesis. Early on in a human’s life, this takes place in many bones, but during development haematopoiesis increasingly centres on flat bones so that by puberty, blood production takes place predominantly in the sternum, vertebrae, iliac bones and ribs. Bone marrow undergoing haematopoiesis is coloured red due to the presence of red blood cells, whereas bone marrow that is not undergoing haematopoiesis is yellow.The red marrow consists of long trabeculae (beam-like structures) within a sponge-like reticular framework. Spaces around this framework are filled with fat cells, stromal fibroblasts and blood cell precursors. A healthy bone marrow biopsy is shown in Figure 1. Figure 1. 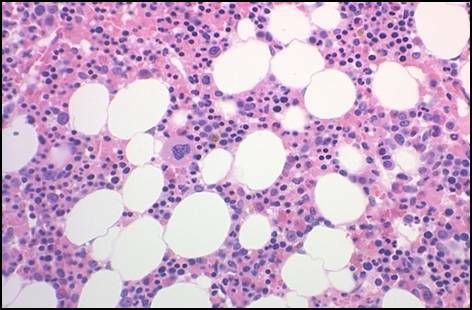 Haematoxylin-Eosin stain of healthy bone marrow (from http://bonemarrowbiopsy.wordpress.com/normal-results/) The haematoxylin has stained the cells’ nuclei purple and the eosin has stained the cells’ cytoplasm pink. The white patches are fat stored in fat cells. During the development of the blood cells, these haematopoietic precursors migrate from the subendosteal region (the inner bone surface) towards a central region (Figure 2). 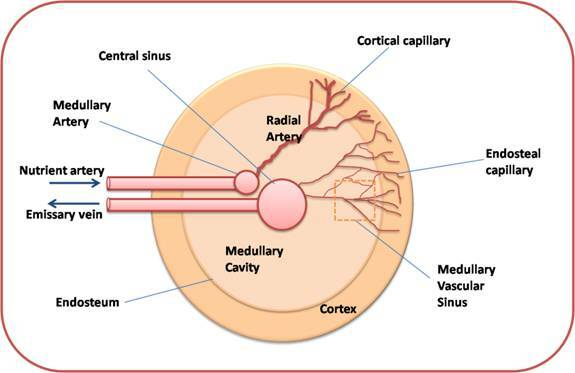 The matured blood cells exit through a dense network of vascular sinuses. Figure 2. Bone Marrow Morphology. Adapted from Nagasawa Nat Rev Immunol. 2006 Feb;6(2):107-16. 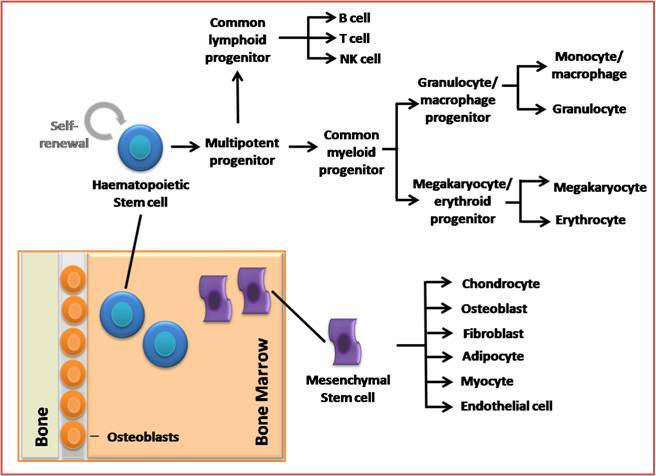 During haematopoiesis the haematopoietic stem cells (HSC) divide, and one daughter cell remains in the bone marrow to continue renewing the HSC pool. The other daughter cell will pass through several stages of development (see Figure 4) to become a mature blood cell and leave the bone marrow to enter the circulation. Mesenchymal stem cells (MSC) are found in the bone marrow cavity and differentiate into a number of stromal lineages such as chondrocytes (cartilage generation), osteoblasts (bone formation), adipocytes (adipose), myocytes (muscle), endothelial cells and fibroblasts. After leaving the bone marrow and undergoing further development, activated antigen-experienced B cells differentiate into plasma cells which return to, and colonise the bone marrow cavity. The framework of the bone marrow and all the cells present within it, along with their secreted cytokines and cell surface receptors make up a complex microenvironment. Maintenance of this microenvironment is important to promote haematopoiesis, cell development and prevent haematological disorders. 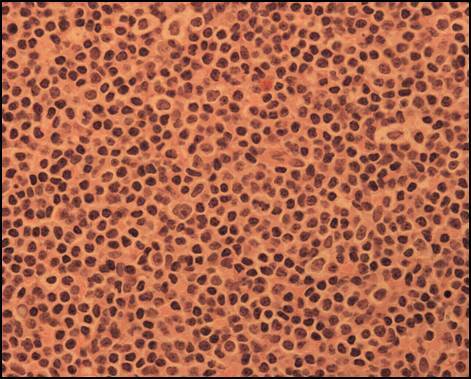 Leukaemias are malignant diseases of the bone marrow and occur during haematopoietic development of either lymphoid lineages in acute or chronic lymphoblastic leukaemia (ALL/CLL) (Figure 3); or myeloid lineages in acute or chronic myeloid leukaemia (AML/CML). Myeloproliferative disorders are related to leukaemias in that they are characterised by the overproduction of one type of blood cell and in some cases develop into leukaemias. There are three main forms: essential thrombocythaemia, polycythaemia vera and myelofibrosis in which the overproduced cell types are platelets, red blood cells and fibroblasts, respectively. Myelodysplastic syndromes (MDS) are a spectrum of disorders resulting from overproduction of one or more type of blood cell. Some cases transform into AML. Multiple myeloma is a malignancy of plasma cells which leads to excessive production of a single paraprotein. Aplastic anaemia is characterised by reduced blood production as a result of loss of haematopoietic stem cells and replacement by fat cells.